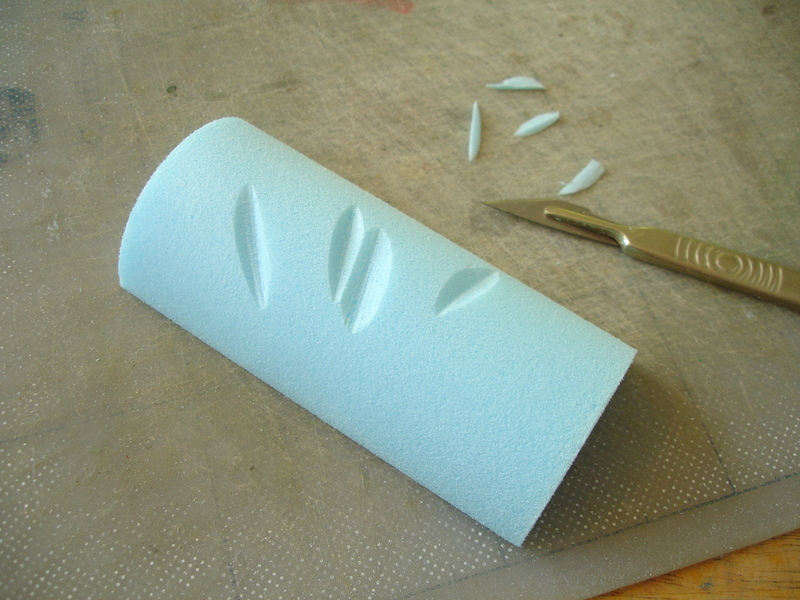 I chanced upon this method of making almost perfect holes in rigid foam after I was asked about the best way to do the same in cake .. making holes to take tube supports between storeys of a wedding cake! For this I very roughly carved ‘teeth’ in the end of a plastic plumbing pipe, which as it turned out could be twisted into the cake without a problem. 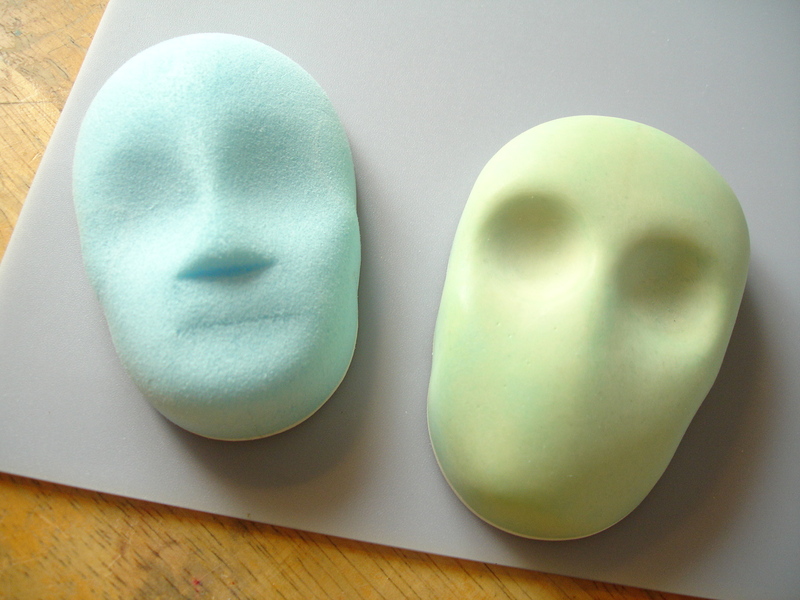 So I wondered whether something similar would work for other materials. I was fairly certain it stood a chance of working if I could cut the teeth finely enough, and for this a slightly harder form of PVC pipe is needed .. MuPVC ..which stands for ‘modified unplasticised polyvinyl chloride’. I’ll need to cover this briefly first. The various plastic waste/drainage pipes you’ll see in any building supplier or DIY store (whether white, black, grey or brown) are likely to be two or more different plastic types. 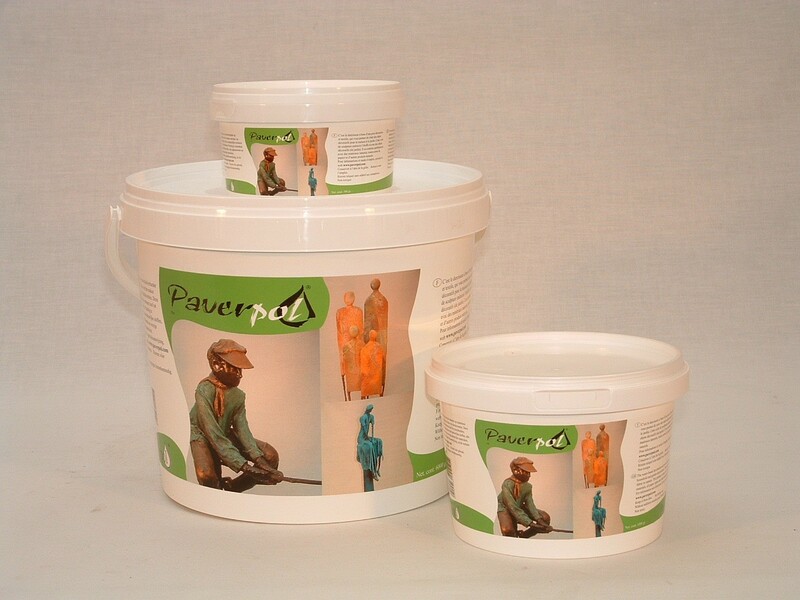 They will either be polypropylene (PP), ABS (a form of styrene), uPVC or MuPVC. 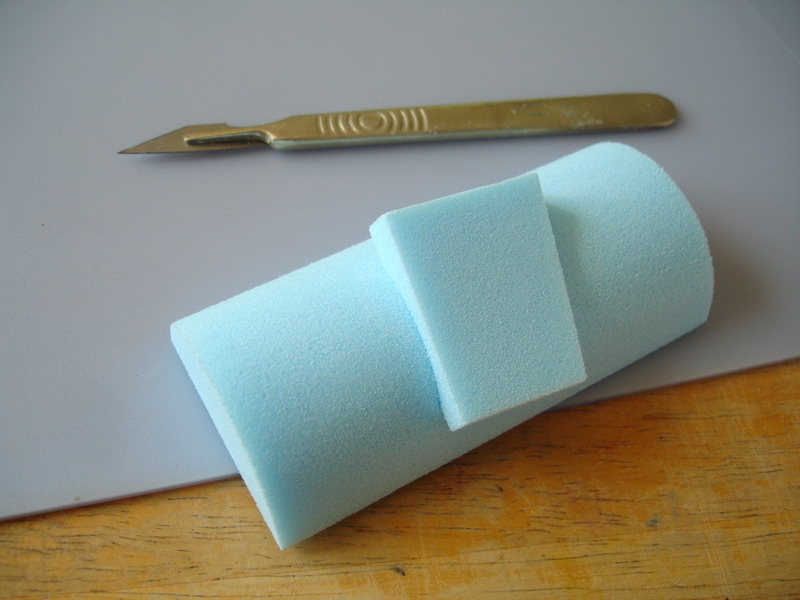 MuPVC is harder than the others, but actually easier to cut or file cleanly because it is slightly more brittle. The only sure way of identifying it is finding the letters ‘MuPVC’ as part of the printed info along the side of the pipe, but also if the pipe is referred to by the store as ‘Solvent Weld’ it’s very likely to be MuPVC. Obviously there are only a few available diameters when it comes to these pipes and it depends on the store which ones they actually have. Standard outside diameters start at 22mm and normally end at around 44mm .. before they become something else, i.e. drainage or guttering pipes which are either brown or black. At the moment in the UK Wickes has the best selection of MuPVC .. 22mm, 36mm, 40mm and 50mm .. but don’t search for ‘mupvc’ in their online catalogue because that will only bring up one of them. Instead find the sub-section ‘Plastic pipe’ in ‘Heating & Plumbing’ which should show all the others, just described as ‘solvent weld’. Wherever and whatever you find, the supplier normally should list the pipe according to its outside diameter, not its internal one. For more technical details see ..
After trialling a few ways of making the ‘cutting’ edge, I found this to be the best method. 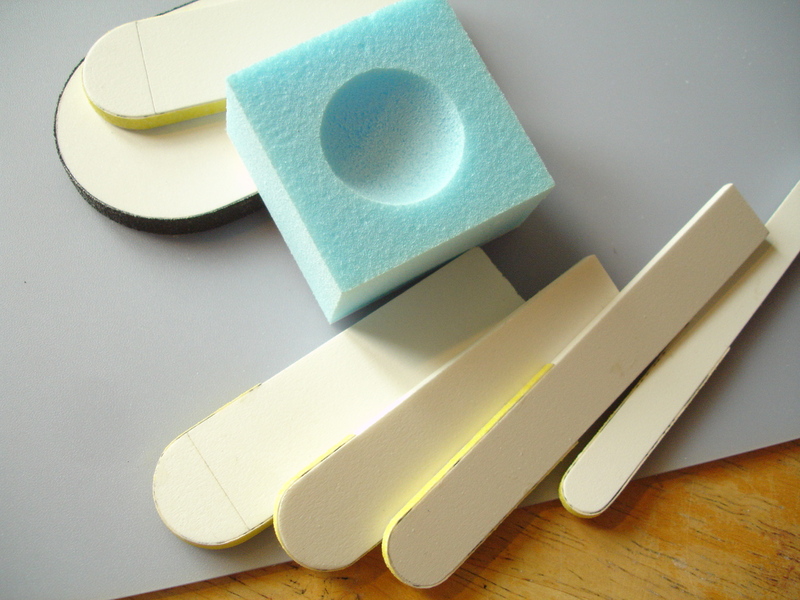 Firstly, the end needs to be cut and filed/sanded straight i.e. at 90 degrees to the pipe length, as above. 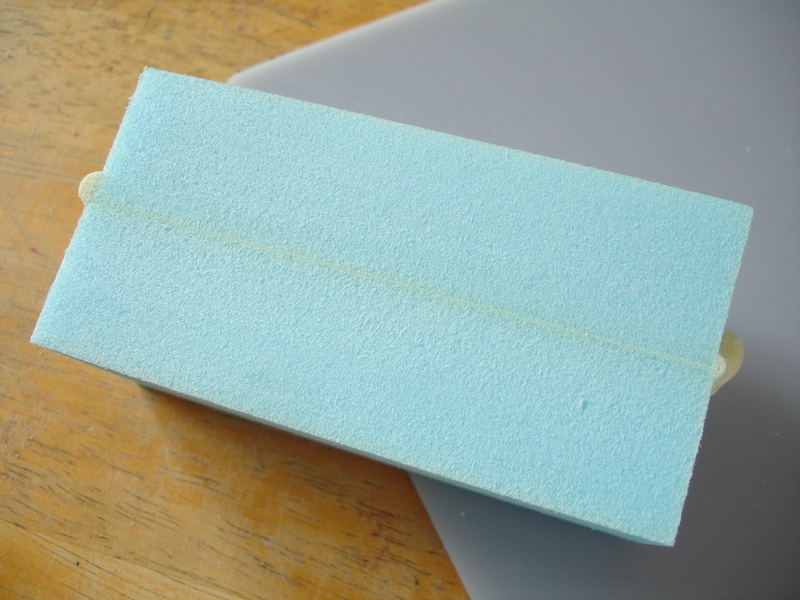 Then, using either sandpaper wrapped around a dowel or a round file, the thickness of the cut edge needs to be reduced to almost a point, as below. This should be a gradual slope (over 5-10mm) and on the inside .. the outside diameter remains constant. The next job is to file the ‘teeth’ and I would recommend using a small-size power drill and a diamond-coated bit .. if you have those things. 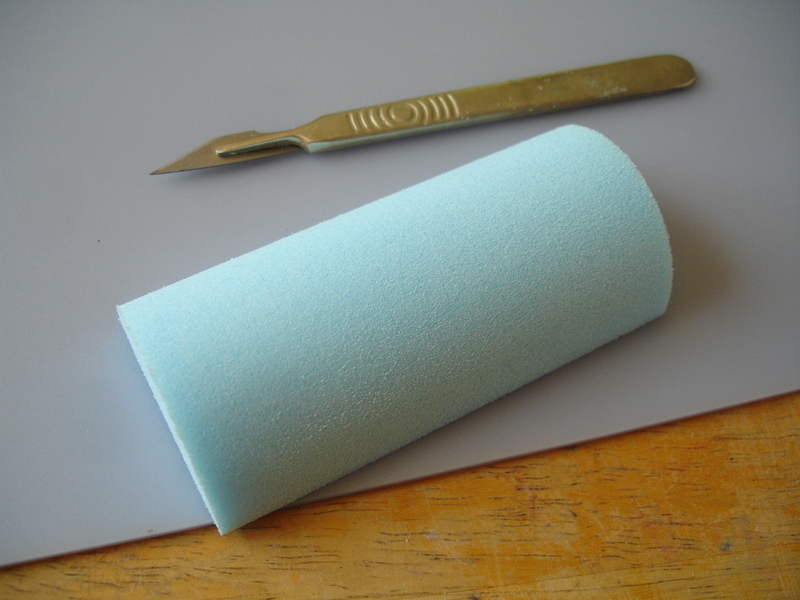 If not you have to do it by hand using a round needle file, but again, I’ve found the diamond-coated needle files more effective on hard plastics. The box of diamond-coated bits below is from Rolson, found in Maplin, costing around £5.00 as I remember. For each of the ‘teeth’ shown below I held the drill bit or file at a slant outwards from the centre of the ring and also slanting forwards around the ring, as saw teeth normally are. 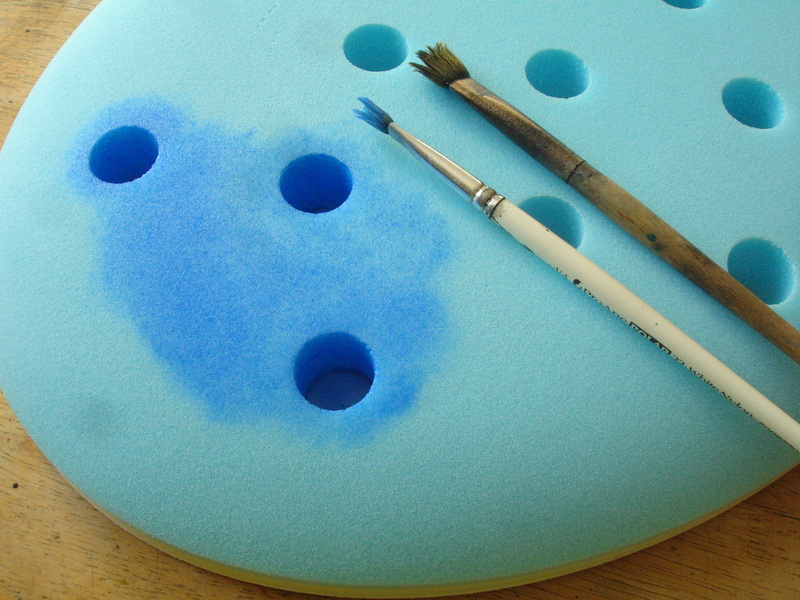 This may look painstaking, but it wasn’t really .. it look a while, but the plastic sanded comfortably. I made the teeth on the inside of the pipe so that the hole cut might be smoother. 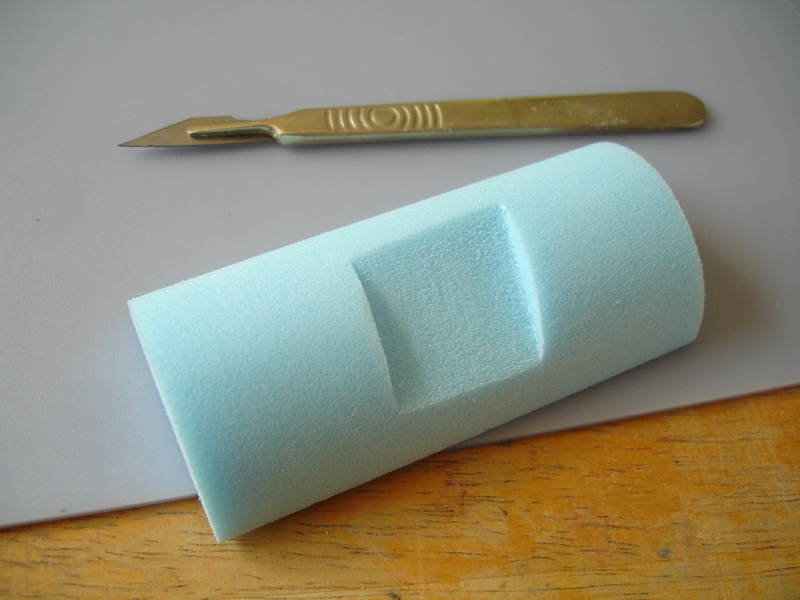 These tools worked well on the three types of rigid foam I work with .. blue styrofoam (extruded polystyrene); Kapa-line foamboard (polyurethane foam), and ‘Recticel’ another polyurethane insulation foam sold in thick sheets i.e. from Wickes. 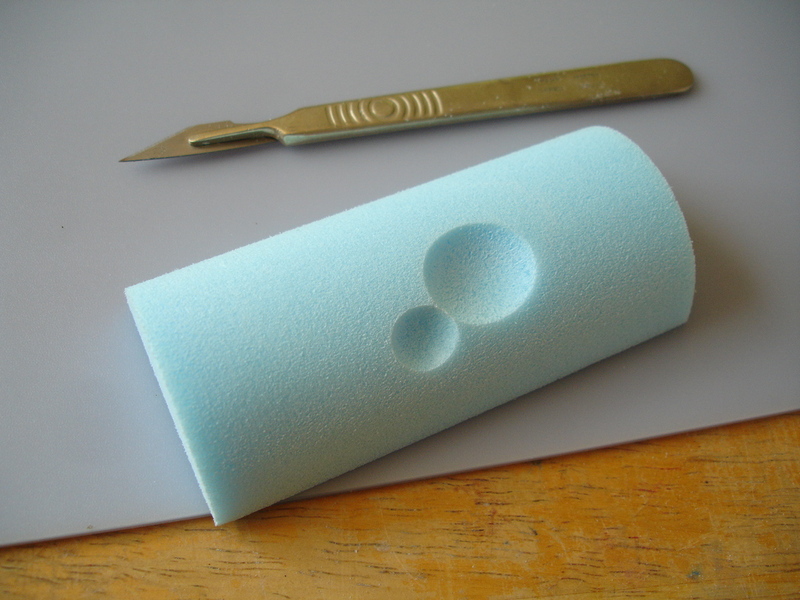 Below, the pipe is first positioned on the foam and then turned very carefully until it has some purchase. After that it needs only moderate pressure while turning, making sure to keep the path of the tube straight .. the angled teeth will draw the tube in. 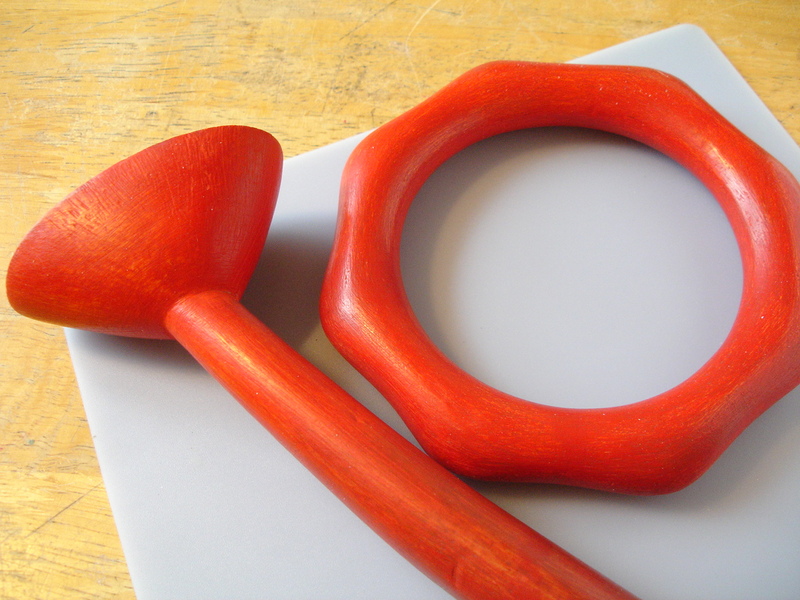 Recticel is very soft and fibrous, but the tool still managed to make quite a smooth-sided hole. I made use of the technique for the sculptural pieces I’m working on at the moment .. i.e. 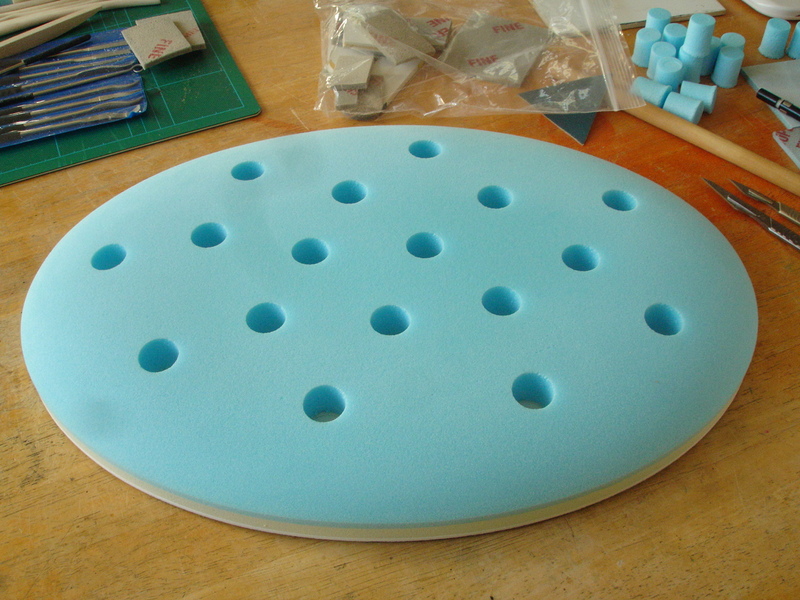 this prototype base shape for casting, which is meant to take a number of peg forms. I’ve made some additions to my .. according to the statistical accounts .. most visited page Shaping Styrofoam which is under ‘Shaping’ in the Materials section. 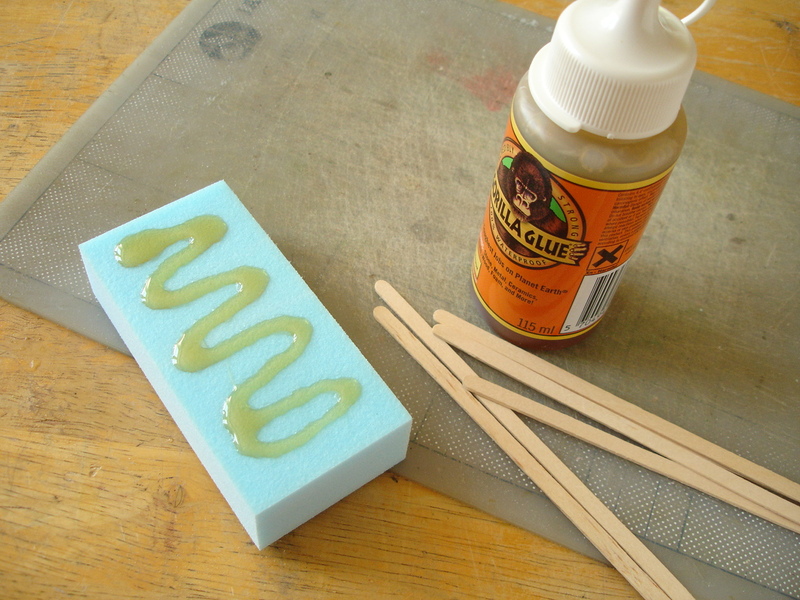 One is that epoxy resin glue works very well to bond it! I’d always assumed that epoxy would damage it, in the way polyester resin does .. but no, it doesn’t dissolve it and the bond is very strong! .. and I’ve used the cheapest stuff around, the one from Poundland! 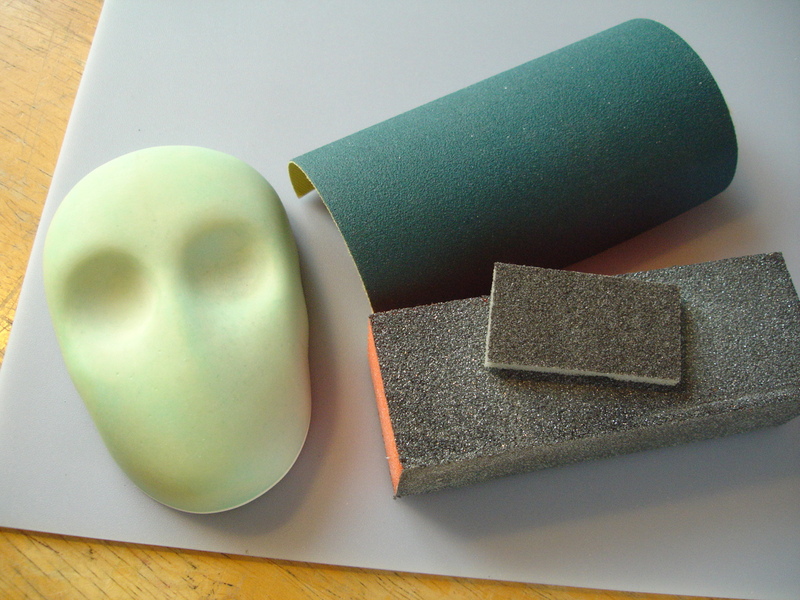 The other addition deals with preparing styrofoam prototypes for mouldmaking and I’m reproducing the entry here. I’m also finally managing, by the way, to hint more at what I’m up to at the moment .. working towards a solo exhibition of my current sculptural work which will take place in or around September next year! 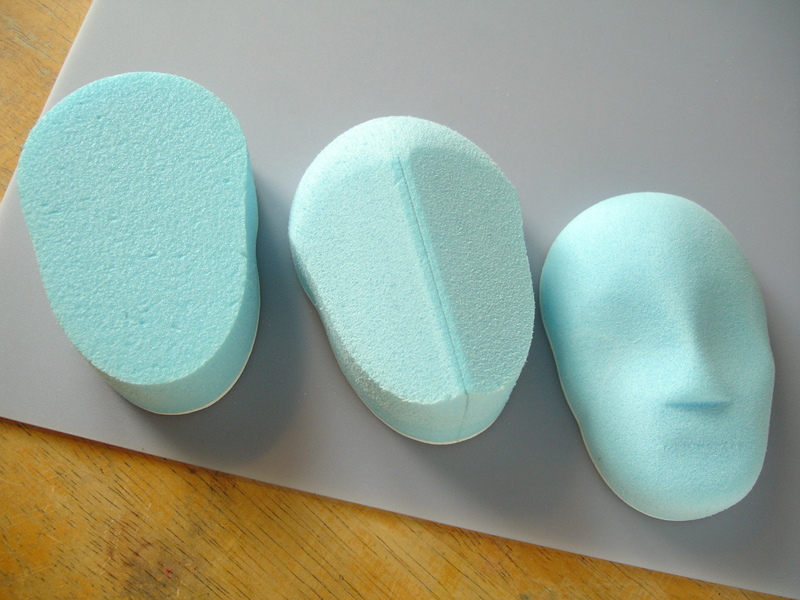 If a styrofoam shape is being made as a prototype form intended for casting it doesn’t need to be made particularly durable .. it only needs to withstand silicone rubber being either brushed or poured over the surface. 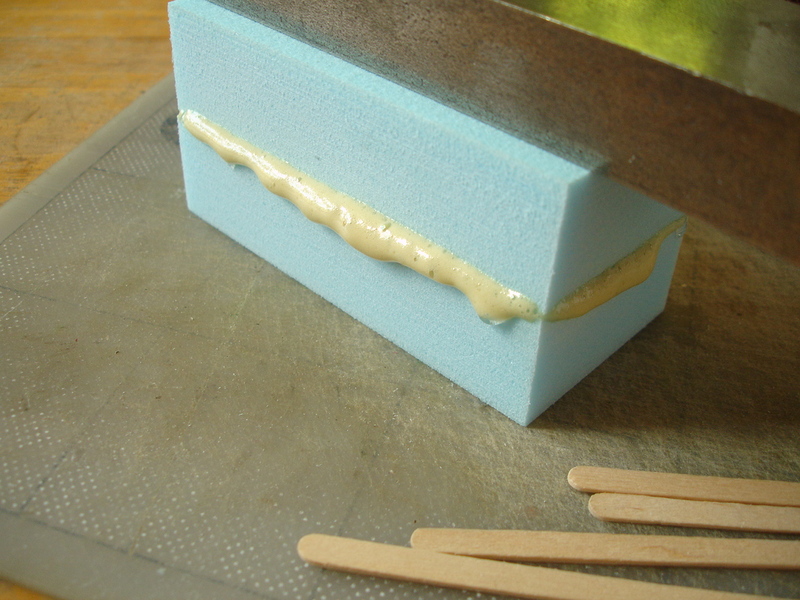 It does however need to be sealed, because if not the silicone rubber will grab into the surface too much and become very difficult to separate. 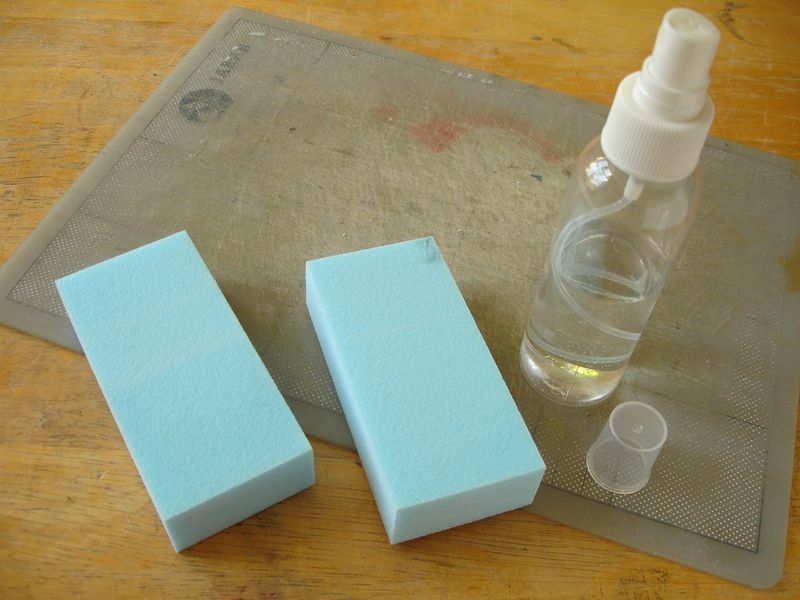 Vaseline (petroleum jelly) is an ideal temporary sealant in this case because it can be easily brushed or rubbed into the micropores without damaging the surface. 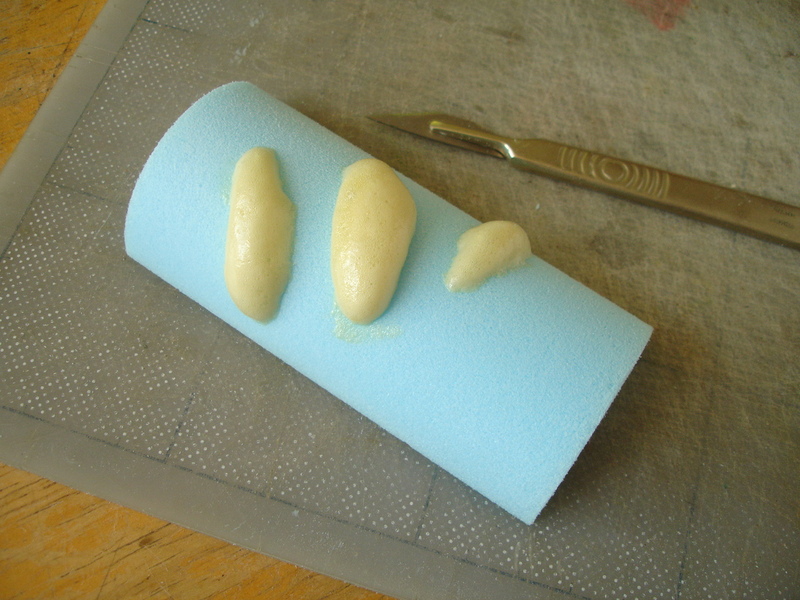 If care is taken not to use too much of it the Vaseline will also even out the surface, although I’ve noticed that most of it is absorbed into the silicone anyway. The only problem is .. it’s very difficult to see where you’re applying it! The solution is to colour it. This is one of many base-unit prototypes I’m making for a sculptural work which I can describe best by its working title .. ‘the ridiculously organic construction toy’! The components of the ‘nature driven’ form system will be assembled by means of holes and joining-plugs, hence all the holes in the base. Once I’ve made the mould from this the base units will be cast in polyurethane. 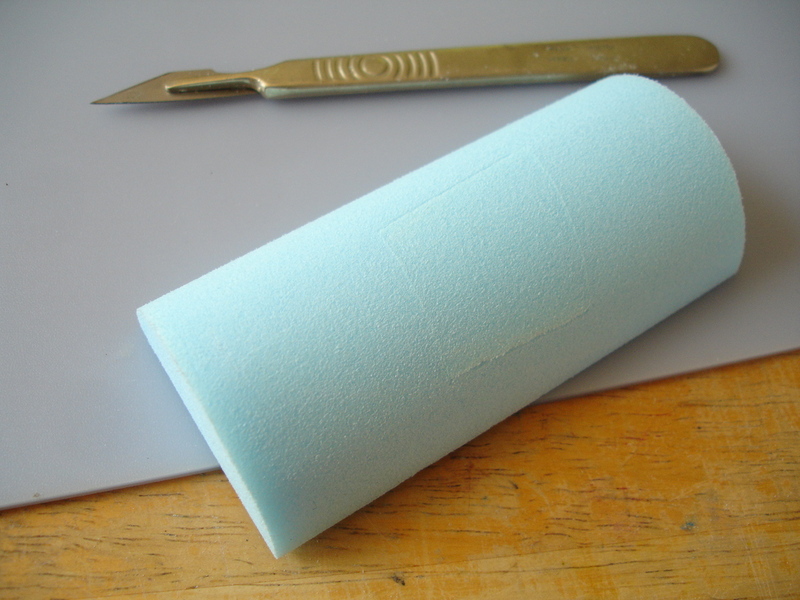 I found a laughably easy way to carve out clean holes in styrofoam and I will explain this method sometime soon. 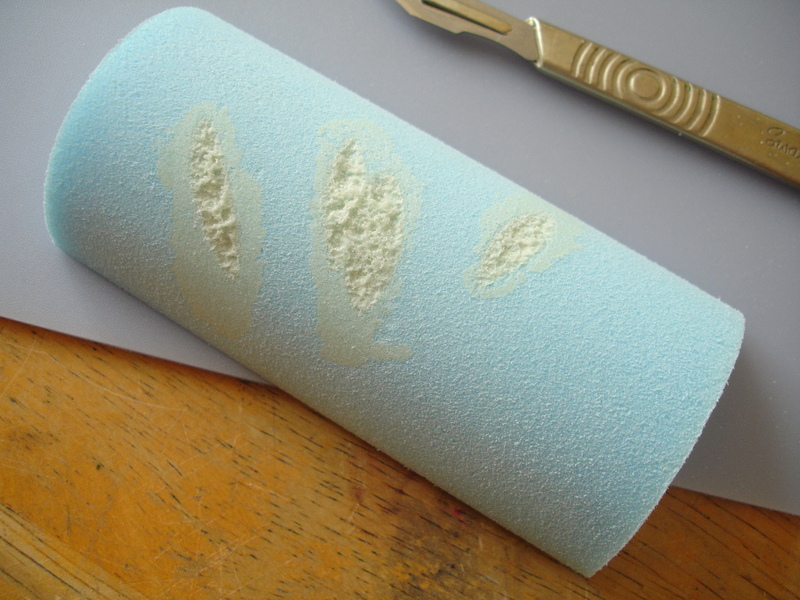 The best way to colour Vaseline is to first mix a little powder pigment, in this case half a teaspoonful, with roughly the same amount of Vaseline to make a thick paste not unlike tube oil paint. 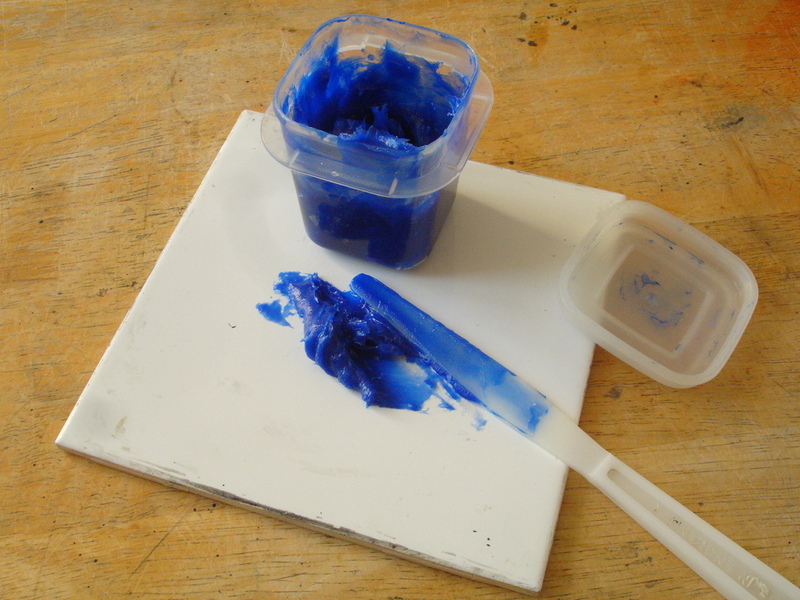 I chose the ultramarine here because it’s a strong pigment and finely ground, combining smoothly with the Vaseline .. some powder pigments may be grainy or clump a bit, which is not so good! The half teaspoonful was sufficient to give a strong colour to c. 50g of Vaseline when I added this to it, but one could use far less pigment. 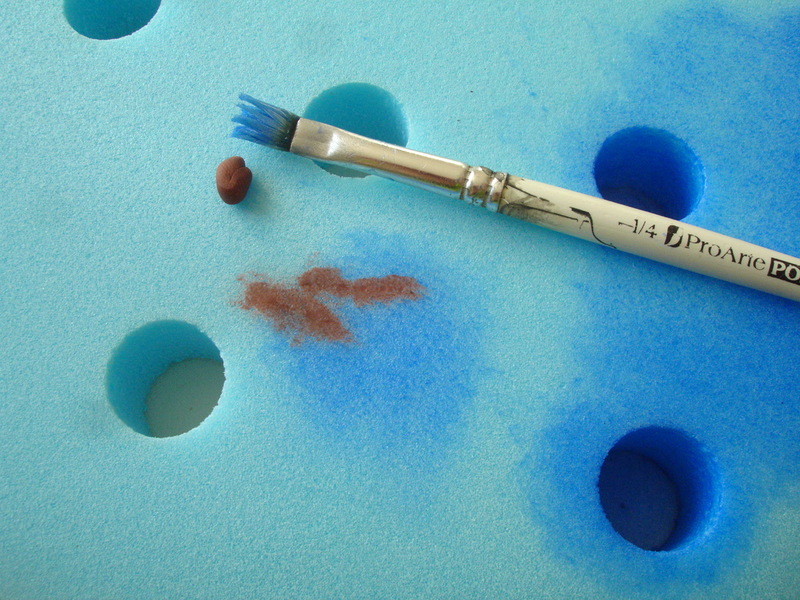 For example, the pigment will stain a porous prototype, so you have to bear this in mind if you want to keep it or if it’s an object of value. There were a couple of larger scratches in the surface which I needed to fill and I’ve found that soft modelling wax (this one is the Terracotta Modelling Wax from Tiranti) is the easiest to use, worked carefully in with a brush. That’s actually it .. surprisingly short this time!